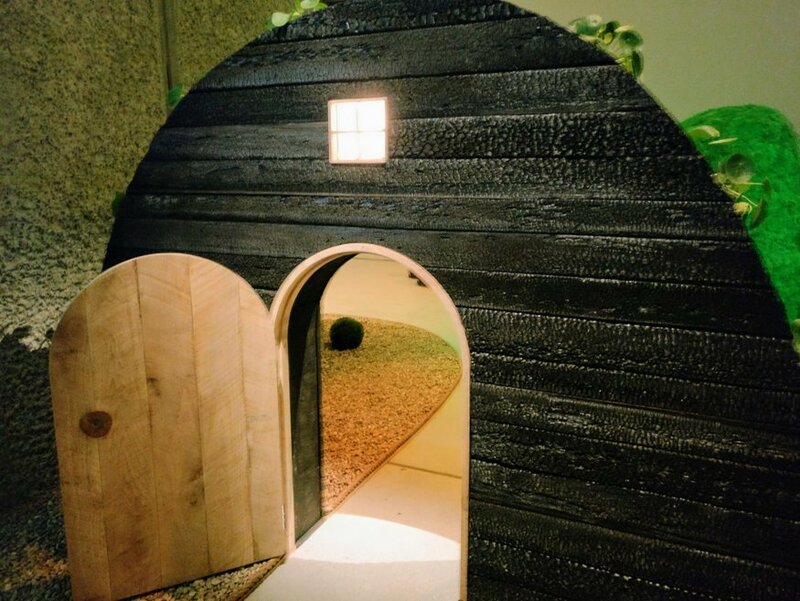 A tiny doorway leads to a garden path and raised house. Kick off your shoes, pick them up, duck under a low wall and climb a ladder into a house raised from the floor. Place the shoes in special shoe cupboards and sit down in a meditative space, complete with teapot and flowers. This is the raised house you can enter from below. 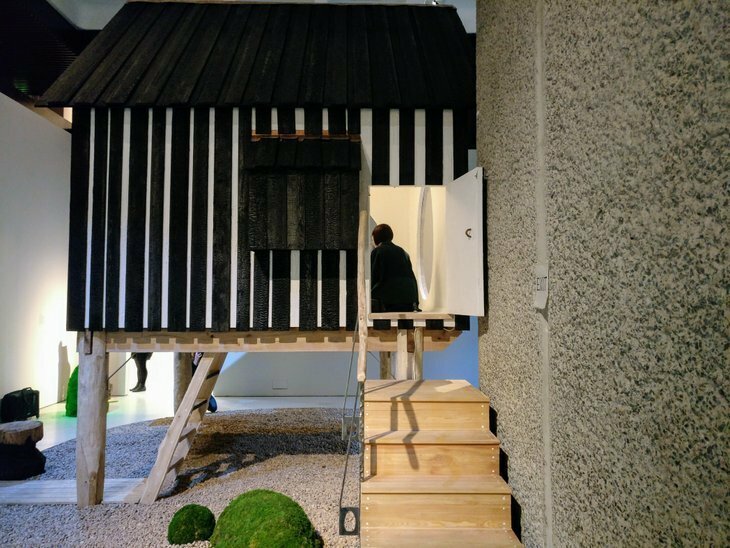 This is The Japanese House: Architecture and Life after 1945, at Barbican. The centrepiece is a full scale reproduction of a Japanese house made of 10 modular units. The rooms are compact and orderly, with a tiny bathroom and a kitchen tucked under the stairs. Though uninhabited, it's not devoid of life; a jumper is casually tossed onto the bed and a stack of books with a Godzilla figure on top gives this home a lived in feel. It's like a more modern version of Dennis Severs' House. 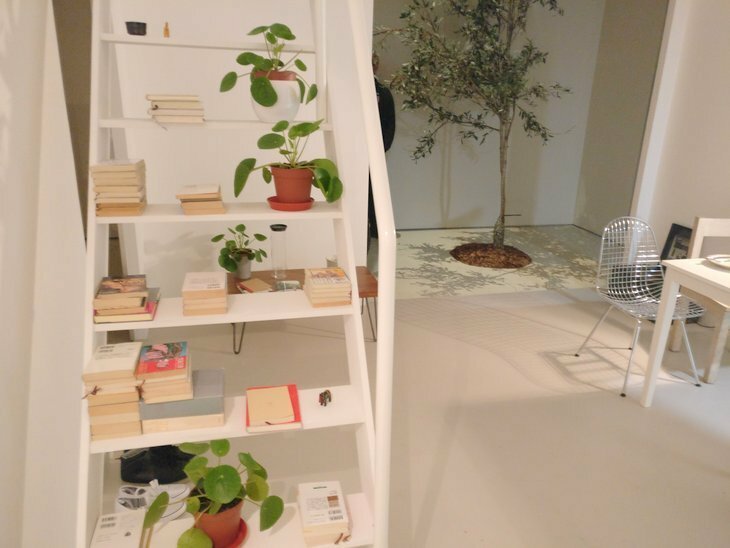 The design is very compact with books everywhere. 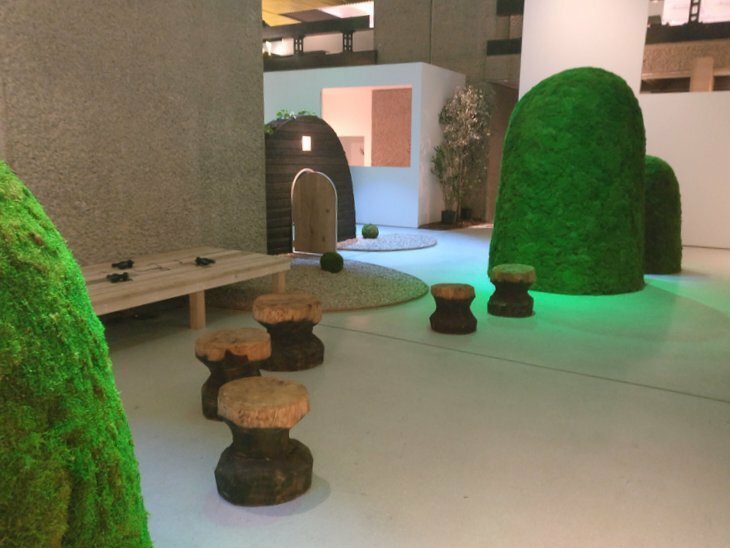 Ryue Nishizawa's design for this project is fascinating; outside merges with inside — topiary gardens with benches give us the feeling we're really wandering around a surreal piece of real estate. 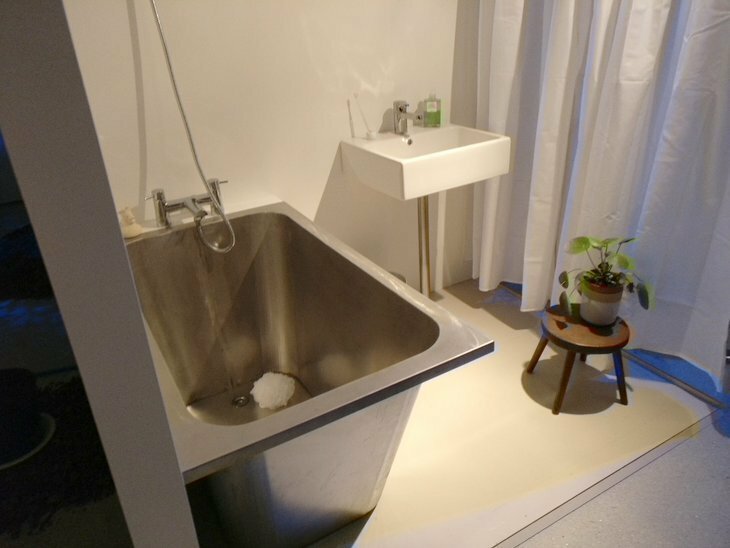 A compact bathroom uses space very efficiently. Life can't be contained within a single lot. People's sense of living expands beyond it, effectively erasing all borders. The view from the top of one unit lets you look into another. Surrounding these interactive designs is information on Japanese architecture: how it values lightness in weight and light in contrast to Western bricks and mortar. 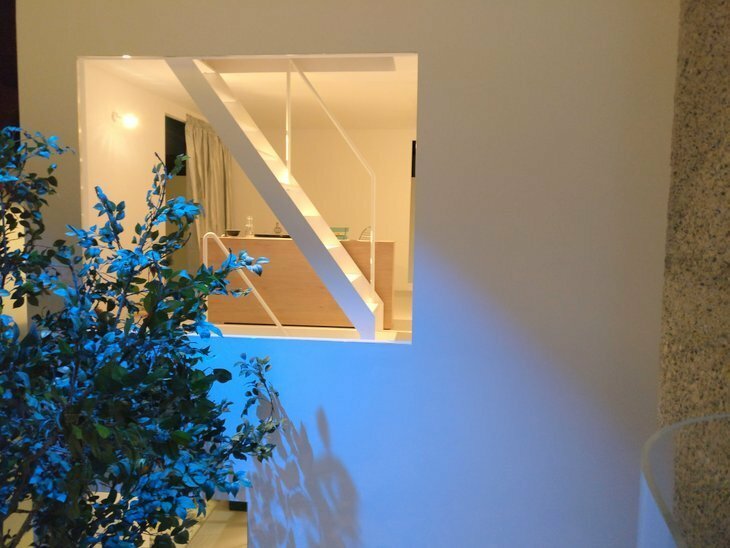 The average lifespan of a Japanese house is only 25 years; designs are being constantly renewed, plus there is a strong philosophy in Japan of architecture as art. There are plenty of architectural models, intricate and fascinating to explore. Architecture is further explored with surreal excerpts from films and television series, all featuring houses. We see a bizarrely violent family causing a house to collapse around them, and an Inception-esque flipping camera artistically showing a home under attack from termites. All this while we're lying down, giant inflatable orange balls swaying behind us. As we say, surreal. Follow the garden path in this tea garden. Japanese architecture's evolution after the second world war is not something we're that familiar with. The Japanese House presents it in a beautifully playful way, and we leave with a much better grasp. 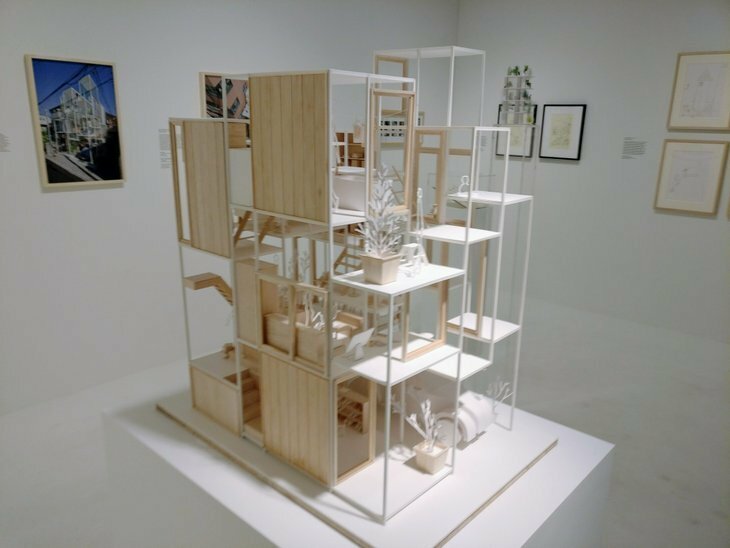 Much like a Japanese house, this exhibition is ephemeral; make sure you see it before it's torn down this summer. The Japanese House: Architecture and Life after 1945 at Barbican Art Gallery until 25 June. Tickets are £14.50 for adults, concessions available.